You’ve chosen to carry one of the most iconic, capable, proven and beloved guns in the history of firearms, the 1911. You need a holster that gives the respect that is due to such a fine choice in a firearm. You need a holster that will accentuate your firearm and give you the options that can take your excellent choice to the pinnacle of concealed carry. With the right holster, your 1911 becomes something of a legend and gives you an advantage that only comes from a versatile, spectacular firearm like the 1911. The first condition is an important aspect of concealed carry. You need to know that when you draw your firearm, it is ready to go and that it will be lethal. It’s why you chose the 1911 in the first place. Now let us help you to find the perfect accessory piece that allows you to use it to the fullest in a concealed carry situation and beyond. You want something that retains the firearm well because while it’s a slim gun, it’s not necessarily a lightweight gun. Having a stiff holster, regardless of material, is the best way to do that. Safety must be a high a priority too. When carrying your gun you want to know that you aren’t going to get a negligent discharge. But you should always feel safe carrying (a holster can help accomplish that peace of mind) and forget about negligent discharge, as most safety concerns can be resolved with proper training and a firearm safety mindset. But you also want to maintain concealability. Having a minimalist holster design can be quite helpful too. If you choose the right features in a holster, it will allow your gun to be the focal point and do its job best. It doesn’t mean you have to skimp; it just means you should be buying a holster that allows the gun to shine as the focal point of your setup. Brand name means something here too. But not just because the original 1911 was designed by John M. Browning, or because it has become an icon that few brands will ever be able to replicate with a single gun, let alone practically every gun made in its image. Brand matters because holsters have long been a part of the mainstream gun culture and have had winners and losers. In the world of holsters, a winner isn’t just a company that markets well, it is a tried and true performer. Brand matters because in the commodity world of the holster market, only the best brands can survive. Some are younger than others, but quality counts for everything; customer service is very important as well. Don’t buy cheap just to save a buck. Sure, we are suckers for a good deal, but we understand in this world of high commodity products, quality doesn’t exist everywhere. Be selective when you choose a holster. If it’s a value-driven product, great, but don’t gamble your life on a cheap holster just so you can feel good about the price point. Buy the best you can get. Avoid being cheap for the sake of being cheap. Forget about getting all the bells and whistles, you don’t need them. The 1911 is a utilitarian gun, and if you’re buying for your race gun built on a 1911, sure, get something flashy and with lots of added extras, but if you want a good holster, look for utility. Especially since that’s the legacy of the 1911. You’ll be better off for it. Leather is the right kind of pairing for the 1911. It speaks to the class, sophistication, and the overall versatility of the gun. That isn’t a must-have option, but it does fit the gun well. If you aren’t into leather or need more flexibility, go with a nice Kydex or polymer holster, to get the modern benefits of such a design. There are other options, but these three types are generally best suited for the 1911, and we will show you why as we explain the importance of the design and material aspects of the holsters on this list. Whatever you do, don’t get a material that won’t last. Forget about ALL elastic and cheaply finished cloth versions; if you go with cloth make sure it’s a robust variant (look below for a couple). Let's take a look at the best 1911 holsters currently on the market. As classic as it gets, this is the holster made famous by Hollywood, but made timeless by the 1911. If you want the look, balance, and the benefits of a shoulder holster, this is about as good as it gets. The brand is known and proven as one of the best in the industry and the design is about as versatile and capable as any on the market. 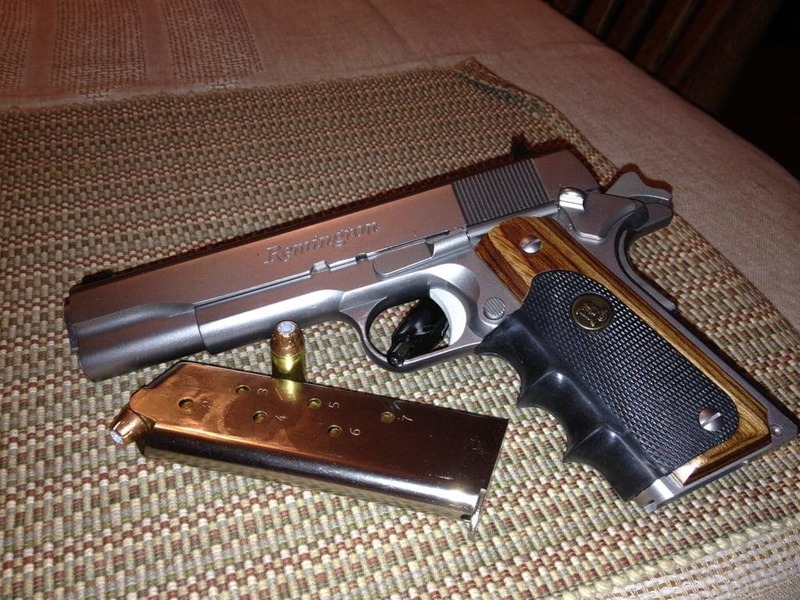 Plus, it looks the part for the 1911. With optimal positioning for seated duty, this is a perfect companion for those who can carry legally and don’t mind being seen carrying. The comfort of this holster is amazing and the weight distribution is among the best in the entire industry, which means a lot if you have to run or chase a target, or if you are carrying all day, every day. This saddle leather holster will endure through years of drawing and re-holstering. This is the holster to buy if you’re seated all day and need to feel confident that you have the most versatile holster on the market. This is a top contender for that title. 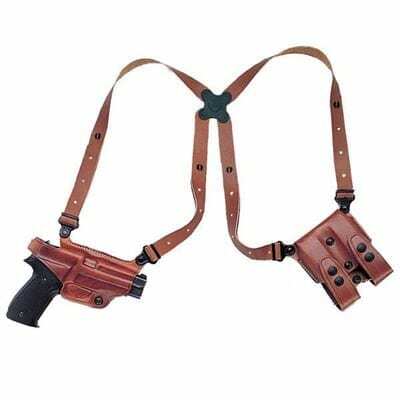 Make sure you understand the concept of the shoulder holster, as it is not for everybody, but for shoulder carry users, it is magical. If you’re looking for a perfect IWB (Inside Waistband) holster for the 1911, you don’t need to look further. This Milt Sparks piece was built to address everything you have on your wish list for a perfect IWB, and they did it with such classy material and build style. There is nothing frivolous about this holster, and yet, it has every creature comfort specification you will find on any holster at the top of the market. This one has it all, without being over the top. 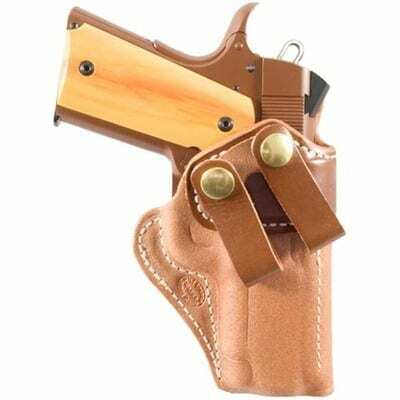 The leather material and brand history are enough to sell this holster, but there is an added value in the design philosophy. The leather surface texture grips the IWB surroundings (clothing and your hip) well and the serious workmanship means you are buying a lifetime holster. You don’t buy the Milt Sparks 1911 holster from the Summer Special 2 line unless you want something truly special for your 1911 daily carry. The features and benefits read like a laundry list of perfect holster design ideas. That’s just what Milt Sparks does: they have excellent base model offerings that perform like the top of the market. When you aren’t sure of the situation and need the ultimate in versatility and on the fly adjustability, this is a very good choice. The construction quality is top notch for a Cordura holster and the features are very nice for the money. Yes, it’s expensive, you can’t get the whole kitchen sink for nothing. The universal build style and the superior quality on a cloth holster make the Alaska Ultimate Chest rig a serious contender. It is not the most concealable, but it’s not really made for that. It’s a perfect item for hunting, tactical situations, or high-risk professions where a gun can be carried easily and should be carried in an optimal position. The hardware used on this rig is top notch, and you won’t be disappointed in the build quality. You can attach the holster to a pack or other rig or carrier as well. This holster does every job well and looks good doing it. You won’t be disappointed with the purchase of this holster. If you need versatility to carry in varied situations, this is a top choice. Alien Gear, more often than not, makes the most superior products on the market for the money. You would be hard pressed to find a better value exchange than with this company. You’re getting top-tier construction, customer service, and performance out of a bargain-priced holster. Two belt clip points on a wide platform offer you rock-solid holster placement. Safer, more easily concealed, and rigid enough to guarantee your handhold, this is the premium option for those that want a guaranteed IWB hip placement so they know exactly what to expect with every draw. The thousands of satisfied customers of Alien Gear Holsters are telling you something: the build quality, customer service, and extended value of the platform put it at the top-tier of gun holsters. For the money, it’s hard to beat, but that’s not the entire story with holsters, as you are likely well aware. You need something that will do the job day-in and day-out for many years. With the Alien Gear line, and this 1911 holster in particular; Buyer beware: you’re getting something AMAZING. 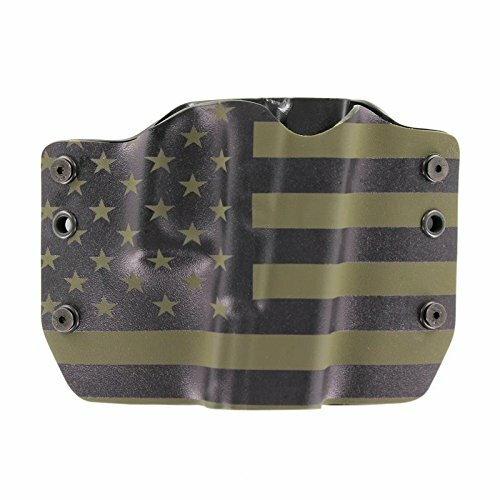 The patriotism that comes in the form of a U.S.A. flag overlay is just a small part of what makes this holster a great choice for the 1911. 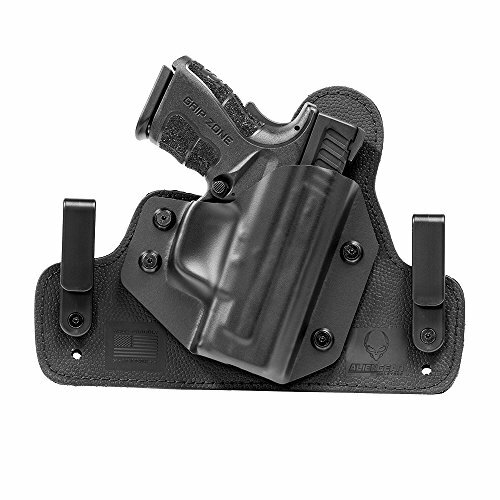 With standard 1.5” belt clips and customizable add-ons that allow you a ton of options for mounting both positionally and stylistically, this is a great core unit for a holster system. It is a minimalist build with a very good footprint that allows you to have just enough coverage to keep your 1911 safe from dents and dings but also keep it in a safe position. The rigid Kydex is both gentle on the finish of your firearm and features a no-sag profile to keep you in a static position at all times. It’s lightweight and drama free, with a slim profile to match the 1911. Kydex is all the rage because it is awesome. It is form-fitting to your firearm, able to hold shapes and be reshaped to meet your needs, and built durably to last forever. If you prefer the “Spartan” design aesthetic and want legitimate results, go with this holster. This is a bargain holster that doesn’t fall prey to that commodity rule that in order to be cheap, something has to be made CHEAPLY. This is made with some legitimate integrity, both from the maker’s perspective, and the design perspective. 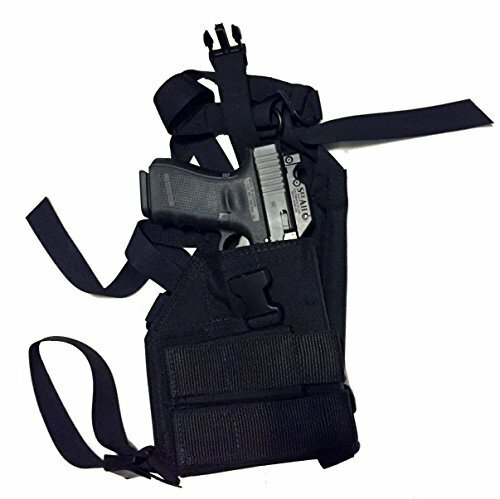 This is a versatile, heavy-duty holster that works well if you decide to go with a cloth design. Cloth may not be the first choice for a lot of users but the Molle inclusion here makes the cloth holster a legitimate option. Yes, admittedly it is not the most concealable holster, but it is very good for those that need extra add-ons, very good adjustability, and a very small price point. The Velcro and elastic additions make this a serious contender for the add-ons that can be put together with it. 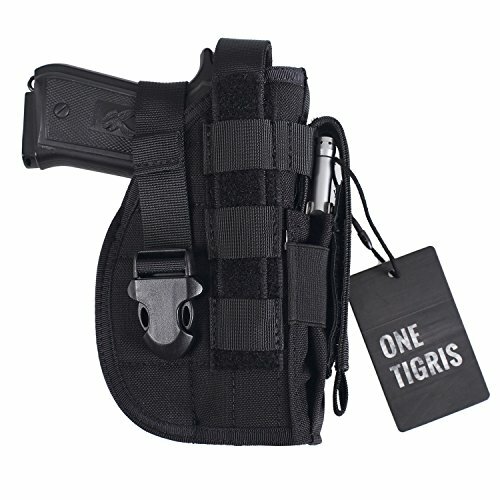 Note: This is a holster that retails at about half the price of competitor options for the functionality and robust build quality. You may be considering this holster because you don’t need a concealed carry holster and you want some added utility. This is a great holster for all-purpose open carry range holster or similar. Not for the most technical of users, but a great design for those who want something they can use for a ton of different things. It’s simple: buy what makes sense for your needs, but trust the content you read here, it’s spot-on. We know a thing or two about holsters, and we know a thing or two about the 1911, and feel confident that our choices make the most sense for the use cases we outlined in our reviews. Our favorite is the Miami Classic; not because of Tubbs and Crockett, but because it has the perfect balance of all the redeeming qualities that a 1911 holster needs, and it does it with grace and stature. It’s also so cool looking, even if it does have its specific use cases. That’s the thing about holsters: how you use them determines their true value. For some, the shoulder rig we like best just won’t make sense. So look at another of these fine options for inspiration instead if that’s you. Don’t be afraid to consider multiple holsters, too. You never know you need a different holster until you try a different holster. Of course we think once you’ve put all this time into selecting a perfect holster for your needs, you should be confident in your choice, but we also think you should be able to squeeze the most versatility possible out of your firearm, because that’s part of its DNA, which is why you chose the 1911 in the first place.